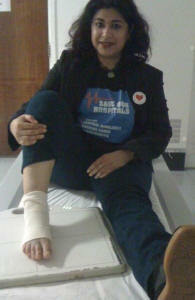 Branch secretary & Women's Officer for Ealing Labour group, Dr. Aysha Raza, is a staunch supporter of Ealing Hospital. Below she tells Meena Toor about her own recent medical emergency. Dr. Aysha Raza is at home, with her feet up, watching the telly. This is not to be mistaken for laziness; Aysha is a qualified neuroscientist working in research at University College London. She keeps her right foot raised as a medical precaution after fracturing her foot in the last march against the closure of Ealing Hospital’s A&E unit. On Saturday 27th April, Ealing borough residents came together to rally and protest against the A&E and maternity services closures for Charing Cross, Hammersmith, Ealing and Central Middlesex Hospitals. Council members from all parties have banded together to support the ‘Save Our Hospitals’ campaign, headed by Dr. Onkar Sahota and backed by Council Leader, Julian Bell. Dr. Raza was making placards and signs the night before the march. On the day, her role was to assist with traffic control. “We had just gone past Ealing Hospital and there were so many people – we had pensioners, parents, students, people using motorised mobility units and people from outside London. “I was with MP Steve Pound, and we were keeping the atmosphere light while stopping and starting the crowds, to avoid congestion. Unfortunately, she tripped trying to avoiding a child who had appeared from no where. “This child breaks away from main march and stands behind me. Next thing I know, I’m on the floor with shooting pains, and – what I thought was – a twisted ankle. “There were hundreds of people still coming towards us so I needed to get out of the way. Thankfully, Steve (Pound) and Councillor Ranjit Dheer were by my side. 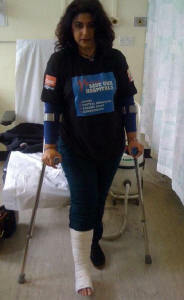 As the protest got to Ealing Common to the final rally, Dr. Raza discovered the extent of her injuries. “I got on the grass and put my foot up. MP Steve Pound got me a 99p flake and called me a ‘brave soldier’. A family member’s operation drew Dr. Aysha to Ealing Hospital on the next day. Her uncle was scheduled for bypass surgery and she was there to comfort him. Thinking she had only sprained her ankle, she decided she would just have to cope with her injury. “It was during the week, while I was with my uncle, my foot had gone from purple to green to yellow, and the pain was getting worse. “I went to the A&E to ask them to check if it was just a sprain. I was happy to be seen within two and a half hours, going through triage, X-ray and then to a specialist doctor. She has praised the work of the Ealing Hospital team, not only for herself in A&E, but for level of care given to her uncle, calling it ‘excellent and wonderful’. “I can get to Ealing Hospital in five minutes on a bus and this has helped me enormously. It would have been so difficult if what they’re proposing happens. The nearest hospitals would be St. Mary’s or Hillingdon hospital.